Defining and measuring quality of life (QOL) is challenging and interdisciplinary, but nearly all can agree on the import role of health. The term health-related quality of life (HRQL) distinguishes the elements of health, function, and well-being that are experienced by people in the context of their health conditions and treatments from general QOL. HRQL measures usually incorporate at least three core domains of physical health, mental/emotional health, and social health in accordance with the 1947 World Health Organizations broadened definition of health. 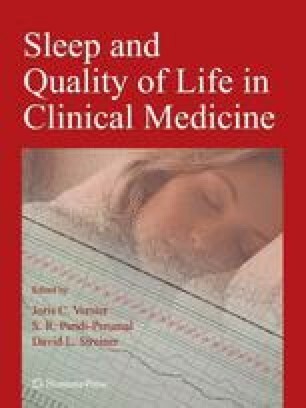 Many theoretical models attempt to describe how health affect QOL, but fall short, especially for describing sleep/wake symptoms or energy/fatigue because these facets of health have both a strong physical and mental health component. Wilson and Cleary’s conceptual model of patient outcomes (1995) proposes a testable dynamic model of causal relationships, bridging the gap between biomedical models and psychosocial models of health. Explicit conceptual frameworks are needed for the use of any HRQL measure, which range from generic measures that can be used across a broad spectrum of the population to disease-specific measures that are tailored to a particular health condition. The family of HRQL measures also include clinimetric measures that rely on expert-driven disease attributes or indicators that “make sense” to the clinician, profile measures that provide an outline of several aspects of HRQL, indexes, and utility measures that represent a preference or value between 0 (death) and 1 (complete health), which can be useful in economic evaluations of health conditions and treatment. Recognizing how patients assess their HRQL when responding to HRQL items by use of the Rapkin–Schwartz Appraisal Model (2004) is useful for understanding HRQL responses, especially in longitudinal studies.